Record prices paid at the recent Tattersalls 2013 Book 1 Yearling Sale have hit the headlines. A Galileo filly, full sister to Oaks winner Was, sold for a record breaking G5m (G = guineas). The median price paid for a yearling came in at G130,000, an increase of 30% over 2012. Today (14th October 2013) the Book 2 sale starts, followed by Book 3 one week later. Yearling are categorised into the three books by Tattersalls based upon a range of criteria, including pedigree and confirmation. Book 1 is the most prestigious and its graduates typically sell for more than Book 2 graduates, which in turn sell for more than Book 3 graduates. So how do the graduates of Tattersalls Yearling Sales perform on the racecourse? In common with all of the sales companies any Tattersalls graduate winning a prestigious race results in a tweet and/or email proclaiming where the horse was sold. But how do the graduates of the sales perform in aggregate? Trainer George Baker in a recent blog post alludes to the reality that some of these graduates will end up plying their trade at a basement level. In this blog post the racecourse performance of all of the 2007 graduates from Books 1, 2 and 3 Tattersalls Yearling Sale is examined. The maximum rating achieved by each horse between 2008 and the end of the 2012 flat season was extracted from the Raceform database, including information from maidens, handicaps and pattern races and the ratings and race performance compared with their yearling sales price. Over 1,500 yearlings were catalogued at Tattersalls Yearling Sale in 2007. Excluding those withdrawn, not sold or bought back, 1,136 yearlings were sold. The Book 1 median was G80,000, twice the Book 2 median of G40,000, with the Book 3 median coming in at G12,000. How do the graduates from this sale perform on the racecourse? Graph 1 below shows the relationship between prices paid and subsequent maximum rating achieved by each horse. The y axis has rating and the x axis sale price. The relationship is noisy. The correlation between price paid and subsequent rating is 0.20. If log prices are used so that the effect of some of the higher priced lots is dampened, the correlation increases to 0.28. At first glance it doesn’t appear as if much of a relationship exists at all. Does this suggest the work of bloodstock agents, trainers and owners trying to identify the best yearlings is of limited benefit? In common with much of the data in horse rating, aggregation enables relationships to be identified. Table 2 gives the median rating achieved across all of the graduates for each of Books 1, 2 and 3. The best horse from Book 1 posted a rating of 135, the best horse in Books 2 and 3 posted similar ratings of 120 and 119 respectively. The median rating achieved by Book 1 graduates was 78, for Book 2 graduates 73.5 and for Book 3 graduates 68. So a relationship between price paid and subsequent rating does exist when the results are aggregated to the Book level. Note that improvements in ratings become progressively more expensive to buy. In trading up from Book 3 to 2, an extra G28,000 bought you an additional 5.5 points of rating, whilst in trading up from Book 2 to 1 you needed to spend an extra G40,000 to garner an additional 4.5 rating points. Table 3 gives the number of individual winners that came out of each book by race category, table 4 shows the same information expressed as a percentage of horses that sold in each book. The numbers do not sum to the total column because a horse can be a winner in each of the three race categories but only once in total. About half of all graduates from the Tattersalls 2007 Yearling Sales are still maidens and the proportion of yearlings that won at least one race seems to be little affected by the Book in which you wrre sold. However the benefits of buying from Book 1 become clear. Nearly twice as many graduates from Book 1 go on to win pattern races compared with the graduates of Books 2 and 3. Book 1 graduates also win the highest proportion of maidens. This result should probably be upgraded because they are likely to have to contest open maidens, which by their nature are the most competitive. Their sales price and stallion fee would preclude them from competing in auction and median auction races. There is also a knock on effect when open maiden horses go on to compete in handicaps. Race standards applied by the handicapper, allied to his ‘on a line through’ methodology, means that the handicap marks of Book 1 graduates may leave less room for manoeuvre than the graduates of other books. It is also likely that Book 1 graduates will be trained with a view to possible Pattern company participation, thus competing in maiden company closer to full fitness than the graduates of other books. As a result Book 1 graduates that end up in handicaps could well be doing so on marks that most closely reflect their ability. All of these arguments can be reversed when the graduates of Book 3 are considered. Differentiation Within Books: Does Paying More Work Within Books? In aggregate the more expensive horses perform better on the racecourse. Is there much difference in subsequent performance if the more expensive Book 1 graduates are compared with those that sold more cheaply from Book 1? Each Book was sorted and split into a top half and bottom half group based upon sale price. The median rating of each group was calculated. Table 5 shows the median price and rating for each of the top half and bottom half by Book. 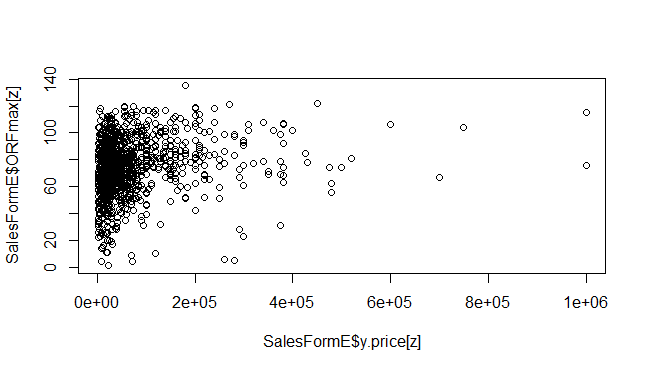 There is a clear relationship between sales price and subsequent rating within each book. In each book the difference is about the same at 9 rating points. The more expensive Book 1 graduates ended up with higher ratings than cheaper Book 1 yearlings. The same is true of Books 2 and 3. In each case the difference in median ratings is about 9 points. It is noteworthy that the incremental cost of each additional rating point depends on your starting rating. In Book 3 it costs G1,800 for every extra rating point, whilst in Book 2 it is G5,455 per point and in Book 1 G21,250. In this respect yearlings trade in much the same way as other trophy assets. When pattern race winners are considered the more expensive graduates of Books 1 and 2 have more winners than those that sold more cheaply – it is most striking in Book 1, with 24 pattern race winners versus 10 from the bottom half. Table 6 gives this information by Book. The usual caveats apply with respect to interpretation given the small sample sizes. When median ratings are compared the more expensive graduates of Book 1 performed best, followed by the more expensive graduates of Book 2. However the next best performer is a tie between the more expensive Book 3 graduates and the cheaper yearlings from Book 1. Yet the more expensive Book 3 graduates have a median sales price less than half that of the cheaper Book 1 graduates, albeit with fewer pattern race winners. If there can ever be value in buying yearlings it appears that, at least in 2007, buying the most expensive Book 3 graduates paid off on the racecourse. It is possible this result is an artefact of the 2007 yearling draft, looking at the results from other years would answer this query. Results from the Tattersalls Yearling Sale from 2007 show a noisy relationship between individual sales price and subsequent rating. However in aggregate the relationship becomes clear – the more expensive yearlings, taken as a group, subsequently performed better on the racecourse. It is when pattern races are considered that the benefits from buying at Book 1 were at their most apparent. The median sale in Book 2 took place at G40,000. In Book 1 this doubled to G80,000. Whilst it might seem poor value that spending twice as much resulted in an increase of just 4.5 rating points in the median ratings for Book1 versus Book 2, it nearly doubled the chances of buying a yearling that went on to win a pattern race. Yearlings are priced off the right had tail of the distribution of expected future ratings, and it is the right-hand skewness inherent in the expected future ratings of Book 1 yearlings that causes them to sell so much more expensively than yearlings catalogued in Books 2 and Book 3. The lottery ticket you buy when shopping at Book 1 has a much greater chance of coming up. When prices within Books are considered the same relationships are confirmed. Buying the more expensive graduates from within each Book resulted in higher ratings than attempting to bargain hunt amongst the cheaper yearlings in each Book. In Book 1 buying the more expensive yearlings resulted in nearly 2.5x as many pattern race winners. Now the noisiness of the relationship shown in Graph 1 above means that bargains were available at all prices and in all books, however the probability of buying a bargain yearling that subsequently performed well at the racecourse was maximised if you bought from amongst the more expensive Book 3 graduates. « Top Rated Selections: Often A Long Wait Between Drinks – Why?